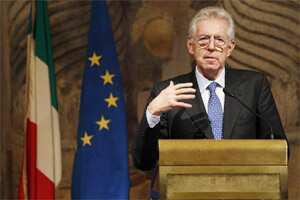 Rome: Prime Minister-designate Mario Monti raced to assemble a new government for Italy on Tuesday while a sharp rise in French borrowing costs raised fears that the two-year debt crisis may spread to the euro zone’s second biggest economy. European shares and the euro fell on Tuesday as investors renewed selling of Italian and Spanish bonds and any relief from having new leaders in Italy and Greece proved short-lived with investors seeking safe-haven assets like German bonds. Global markets harbour deep concerns about whether Monti and new Greek leader Lucas Papademos, unelected European technocrats without a domestic political base, can impose the needed tough austerity and far-reaching economic reform. A think-tank report said the situation in triple-A rated France should also be “ringing euro zone alarm bells" because of the country’s inability to make rapid adjustments to its economy. Germany and France posted solid growth in the third quarter, statistics released on Tuesday showed, but euro zone nations on the front line of the debt crisis fared much worse and analysts expect bleaker times ahead in the core economies. “The German economy has lost its immunity," said Carsten Brzeski of ING, a Dutch bank. “With the latest stage of the sovereign debt crisis, today’s numbers are as good as it gets for the German economy." As the euro zone’s largest economy and growth engine for the past two years, any hiccups in the coming business quarters in Germany would have wider effects in the region. A rebound in household consumption lifted France’s growth to a better-than-expected 0.4% in the third quarter, after a contraction in the second, but economists warned it was just a lull before a likely return to recession. “You could call this the lull in the storm," said Marc Touati of Assya Compagnie Financiere. “What’s worrying is that industrial investment has started going down, which proves that the virtuous circle of investment, growth and job creation is not working." The urgency of resolving the crisis was underscored by a report by the Lisbon Council, which said France’s inability to make rapid adjustments to its economy was a serious worry and should be of acute concern for the euro zone. “Among the six euro zone countries with a AAA rating, France achieves by far the lowest ranking in the study’s fundamental health check," the Brussels-based think-tank found in the 75-page report, called the Euro Plus Monitor. “The results are too mediocre for a country that wants to safeguard its place in the top league ... Alarm bells should be ringing for France." With the survival of the 17-state currency zone in its current form now at risk, EU governments have until a summit on 9 December to come up with a bolder and more convincing strategy, involving some form of massive, visible financial backing. Prospects are uncertain as the German government, the Bundesbank and hardliners in the European Central Bank have so far blocked key policy options. These include issuing common euro zone bonds, mutualising the euro zone’s debt stock, letting the ECB create money to fight the crisis, or having it act as lender of last resort, directly or via the euro zone rescue fund. The debt crisis is likely to make matters worse in the next months with nations such as Italy, Greece, Ireland, Portugal and Spain forced to adopt politically unpopular cuts to stop the bond market driving them towards default. Economists say there is no visible growth strategy in place to counter those austerity measures. German Chancellor Angela Merkel caught the mood of crisis with a stark warning on Monday that Europe could be living through its “toughest hour since World War II". She told her CDU party she feared Europe would fail if the euro failed and vowed to do anything in her power to stop this from happening. Monti pursued his efforts on Tuesday to secure support from feuding politicians to allow his cabinet of experts to speed up reform of pensions, labour markets and business regulation needed to put Italy’s finances on a sustainable footing. Italy has to refinance some €200 billion ($273 billion) of bonds by the end of April, a daunting prospect. High borrowing costs and the release of figures showing industrial production slumped by 2% in the euro zone in September, raised the spectre of recession and provided a gloomy backdrop to Monti’s talks with the heads of smaller parties. “Monti spoke about a significant programme with many sacrifices," Francesco Nucara, a lawmaker from one of the myriad tiny parliamentary groups involved in the talks, said after meeting the prime minister-designate. Monti, a respected former European commissioner, on Tuesday met leaders of the two largest parties of the centre-right and the centre-left, unions, and representatives of women and youth groups. Expected to seek a confidence vote by Friday, Monti has said that he aimed to serve until scheduled elections in 2013, not just until reforms had been pushed through. Far-reaching reforms are seen as crucial if Italy is to end years of stagnant growth, trim a debt mountain equal to 120% of gross domestic product and avoid the sort of crisis that forced bailouts of Greece, Ireland and Portugal. Papademos said late on Monday that Greece had no choice but to stay in the euro zone, telling lawmakers reforms were the only solution. But conservatives on whom Papademos must rely for support demanded pro-growth policies and rejected any more cuts, fueling fears of a Greek default that may force Athens out of the currency group triggering a euro zone debt meltdown. Austerity measures had deepened Greece’s recession but reforms -- including widening the tax base and fighting rampant tax evasion -- could mitigate the problem, said Papademos, who oversaw Greece’s entry to the euro zone in 2002. But New Democracy leader Antonis Samaras said he would not vote for new austerity measures. Spending cuts and tax rises agreed with foreign lenders should be changed in favour of economic growth, he said. Inspectors for Greece’s international lenders, known as the troika, were due to meet Papademos’s administration after the confidence vote, but an EU official said the visit might not happen until the end of the week. Most Greeks hailed Papademos’s appointment, but thousands of people angry at more than a year of austerity are expected to rally on Thursday, the anniversary of a 1973 student uprising that helped to bring down the colonels’ junta of 1967-74.